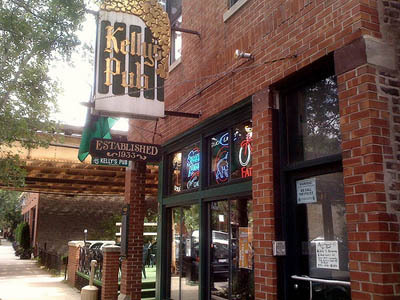 KELLY'S PUB is another one of our favorites, in particular for staying open until 3:00 AM on Saturday nights! It's a small bar and it has a big college crowd, which also makes it quite a destination for St Patrick's Day. They've got live bands and DJs keeping things jumping on the weekends, but the weeknights are just as good for chilling and enjoying the atmosphere. It's been open since 1933 and shows no signs of stopping anytime soon! We love the dollar fifty Bud and Bud Light on Tuesdays, and of course the one buck burgers and fries!